On Wednesday, March 10, thanks to the initiative promoted by Sicilia Mondo, women of the Ibleo Social Club in Melbourne participated in an event entitled ‘Donna in Emigrazione’. The event was directed by Mrs Gabriella Gomersall Hubbard of CO.AS.IT. (and contributor to Il Globo and Rete Italia), who mentioned how much Italian women sacrificed to follow their husbands to Australia and integrate into this new country. Some of them wanted to put into writing their own experiences, outlining the difficulties and hardship they faced in this foreign land. The main problem at the time of their arrival was the language barrier, but thanks to the support of friends or neighbours, they managed to overcome this difficulty. On the day, many publications were presented, including the likes of Amalia, a Long Journey by Maria Triaca, a rich biography which tells the story of sisters Amalia and Matilde, who arrived in Australia in 1904. 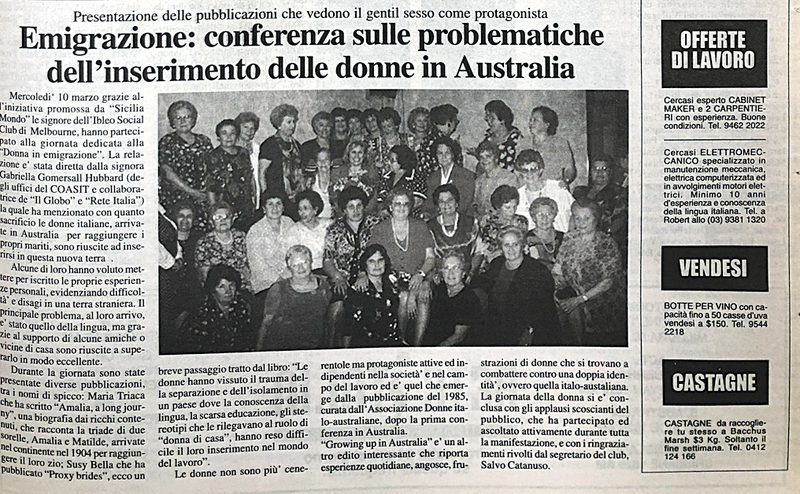 Women are no longer Cindarellas, but rather active and independent protagonists in society and in the workforce, and that’s what emerges from the publication of 1985, compiled by the Associazione Donne Italo-Australiane following the first conference in Australia. Growing up in Australia is another interesting text which records the everyday experiences, anguish and frustration of Italo-Australian women battling identity issues. The event concluded with a standing ovation from members of the public, who actively listened and participated in the day. Secretary of the Ibleo Social Club, Salvo Catanuso, thanked all for attending. This story appeared in the Wednesday April 14, 1999 edition of Il Globo.